• How you can keep the home fires burning, become part of the Allied war effort, or risk everything by joining the partisans to bring down the Reich from within! The Investigator’s Guide to the Secret War is the definitive guide to the late 1930s and ‘40s for use by players and Keepers alike. Don't miss the Achtung! Cthulhu Keeper's Guide to the Secret War also available now. The essential wartime reference for any Keeper or fan of the Cthulhu Mythos. A full-blown tome of dark knowledge, including - Allied and Nazi forces & intelligence agencies, New rules and strategies for World War Two combat & survival, Key characters & vile creatures, New tomes, secret weapons, artefacts & equipment, Occult organisations and Mythos-based missions, Full rules for use with Call of Cthulhu 6th Edition and Savage Worlds in one book! In fact – There’s a whole Shoggoth’s worth of Cthulhu villainy, enough for any Keeper to have his investigators dead, insane or running for their lives in no time! Get the Keeper's & Investigator's Guide Bundle! Will you update this for Savage Worlds SWADE as well? 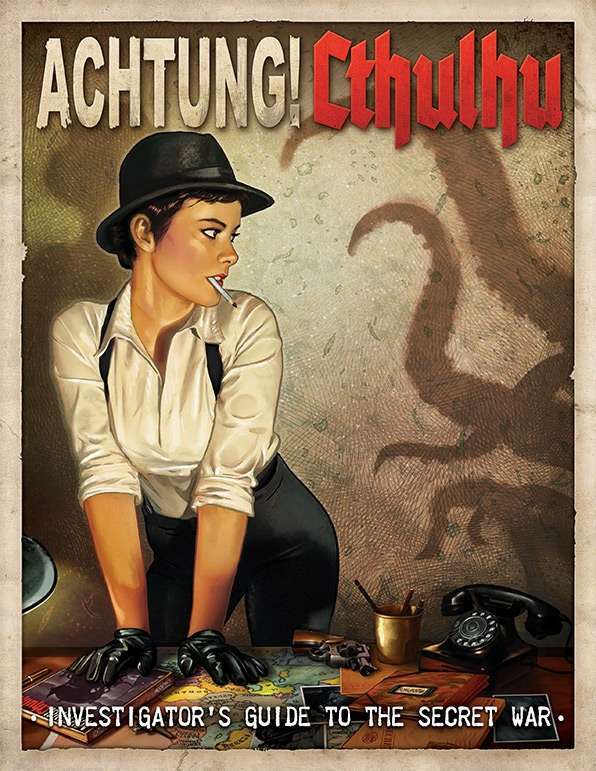 Also will it be a Call of Cthulhu 7th edition update only, or also a Pulp Cthulhu update? Currently we're just planning an update to CoC 7th Edition. Will that be a new release or an update to this? It's your decision of course but updating existing Savage Worlds material to the SWADE version is just minimal work. Pinnacle will also provide upgrade guides (probably for publishers as well), and with the new release, there will be a lot of people interested in SWADE material. Alright, What in the world is up with the price of the physical copy of this book? The Keepers guide goes for anywhere between $30-$50, while the lowest price I found for this a $500!!! And the higher price was over $1000... What am I missing? Are there the printer-friendly files in the Achtung! Cthulhu pdf line? Thank you very much! is the game more suited to CoC or SaWo ? Can this version be used with 7th edition of Call of Cthulhu ? Yes - 7th edition includes a short section on converting 6th edition material, it's really very simple. When it means compatible Call of Cthulhu 6th edition and savage worlds, does that mean I need one of those systems to play this or is it completely compatible on its own? Does anyone know if they doing a POD verision of these books? I'm very interested, but wanted to wait for the physcial book. Thanks!